On September 9 and 11, 2009, I noted a dangerous aspect of the Senate health insurance reform plan (which I called MaxTax, after Max Baucus) that would ultimately become ObamaCare: it would give Walmart and all other low-wage employers an incentive to keep its employees in poverty. It was the only way to get them health insurance for free. The MaxTax offers this one, giant, out for corporations. A Medicaid-eligible individual can always choose to leave the employer’s coverage and enroll in Medicaid. In this circumstance, the employer is not required to pay a fee. In other words, the one way–just about the only way–a large employer can dodge responsibility for paying something for its employees is if its employees happen to qualify for Medicaid. Under MaxTax, Medicaid eligibility will be determined by one thing: whether a person makes less than 133% of the poverty rate. And who has the most control over how much a particular person makes? Their employer! So if Wal-Mart wanted to avoid paying anything for its employees under MaxTax, it could simply make sure that none of them made more than $14,403 a year (they’d have to do this by ensuring their employees worked fewer than 40 hours a week, since this works out to be slightly less than minimum wage). Or, a single mom with two kids could make $24,352–a whopping $11.71 an hour, working full time. That’s more than the average Wal-Mart employee made last year. So long as Wal-Mart made sure its employees applied for Medicaid (something it already does in states where its employees are eligible), it would pay nothing. Nada, zip. Nothing. Saturday, HuffPo mapped out what I, too, have been watching. Walmart is making the changes necessary to prepare to do this–charge you and I for health insurance for its employees (actually, more of its employees, as it already uses this approach where it can), all premised on the legal poverty Walmart imposes on its workers–by kicking precisely those employees who will qualify for Medicaid off Walmart insurance. Walmart, the nation’s largest private employer, plans to begin denying health insurance to newly hired employees who work fewer than 30 hours a week, according to a copy of the company’s policy obtained by The Huffington Post. Under the policy, slated to take effect in January, Walmart also reserves the right to eliminate health care coverage for certain workers if their average workweek dips below 30 hours — something that happens with regularity and at the direction of company managers. Labor and health care experts portrayed Walmart’s decision to exclude workers from its medical plans as an attempt to limit costs while taking advantage of the national health care reform known as Obamacare. Among the key features of Obamacare is an expansion of Medicaid, the taxpayer-financed health insurance program for poor people. Many of the Walmart workers who might be dropped from the company’s health care plans earn so little that they would qualify for the expanded Medicaid program, these experts said. “Walmart is effectively shifting the costs of paying for its employees onto the federal government with this new plan, which is one of the problems with the way the law is structured,” said Ken Jacobs, chairman of the Labor Research Center at the University of California, Berkeley. I hate to say to the boy wonks who poo-pooed my concerns in 2009 I told them so. But I told them so. What HuffPo doesn’t mention in its piece on this, though, is that this is all presumably by design. 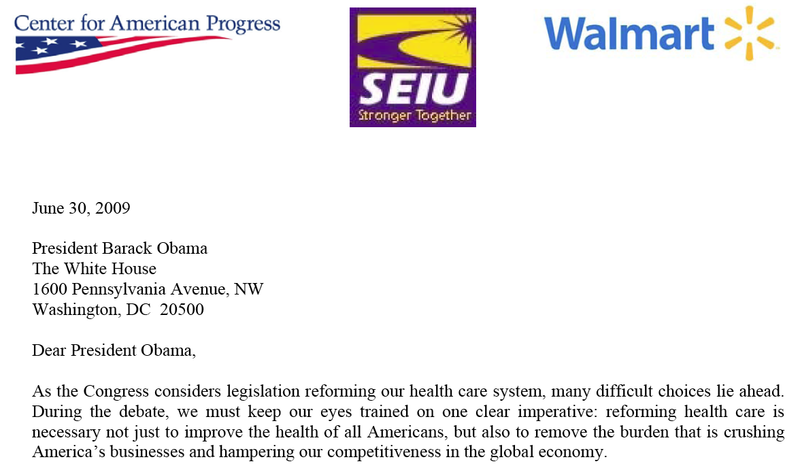 Walmart, after all, was one of the partners behind the push for ObamaCare. 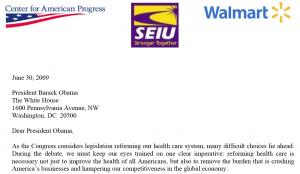 In fact, as things started to drag in summer 2009, WalMart partnered with Center for American Progress and SEIU to try to nudge the process along. While the letter signed by the heads of all three organizations preaches of “shared responsibility,” it also talks of removing “the burden that is crushing America’s businesses” and an employer mandate that does not “create barriers to hiring entry level employees” (as workers forced into part time unskilled positions are sometimes facetiously called). Walmart gave ObamaCare a lot of credibility back in 2009. It was clear then what the payoff was going to be. And they’re cashing in now: by making the poverty wages they pay their employees the trick to get us to pay their employee health insurance, rather than the billionaire Waltons who can afford it. Update: In other “I told you so” news, Liz Fowler–the former Wellpoint exec who wrote this legislation for Baucus–is headed back to industry to cash in. When a bad law offers companies massive incentives to use part time workers and/or pay low wages, no one should be surprised when companies structure their employees hours and wages to take advantage of those incentives. From Walmart to pizza and everywhere in between, bean counters are running the numbers and doing exactly what the design of Obamacare incentivizes them to do. This is by design. A feature, not a bug. Recall that Obamacare effectively “punishes” health care plans that are “too generous.” And that one of the goals was to move away from employer sponsored care. Seems like the bill of goods that so many bought into is working exactly as intended. I look forward to the progressive blogs directing their ire over this at the appropriate target. That target isn’t the employers who are doing what this law essentially begs them to do. Nope. The appropriate target is the Democrats who wrote this law under the direction of the Democrat in the White House. Obamacare is just another scam designed to line the pockets of for profit insurers while making business “more competitive.” And the rubes fell for it. @Roman Berry: By “look forward” you must mean “read historically” because I’ve been calling this plan Neo-Feudal for years. And the moniker “MaxTax” should make it clear to you I named names. @Roman Berry: From what I hear the pizzamakers and restaurants that spoke out about this have seen significant declines in operating income as people vote with their feet and take their business elsewhere. Maybe in the long run it will prove to be best to simply provide the employees the health care the law intended. Didn’t Walmart get a financial benefit of a gov’t contract for the electronic medical records development from Obamacare? A good percentage of Wal-Mart employees receive government assistance now. I know I work with people who get SCAN and Chaper 8 housing benefits AND work at Wal-Mart. So we already subsidize many of their employees so why not take care of them when they have health issues. Don’t shop at wal mart. @bsbafflesbrains: I’m not averse to giving them Medicaid. I’m totally averse to incenting WalMart to make sure they remain below 133% of poverty level, which ObamaCare does. @emptywheel: Any exposure of the bad practices at Wal-Mart is good. They are bad for business in general and humanity specifically as the fire in Bangladesh, their response to worker complaints in the U.S., and the bribery scandals in Mexico and India clearly show. If they were forced out of business it would provide the impetus for a sea change in more humane standards for employees worldwide. This is off topic a little bit but I don’t understand why the Democrats don’t push to have the three portions of the federal budget, two of which are financed with dedicated taxes, separated with each worked on independently. Social Security has a dedicated tax and is running a surplus. There is no need for any cuts in SS. Medicare (mostly) is financed with a dedicated tax and those portions covered by the tax are also running a surplus. You begin to run into problems when you add in the unfunded prescription drug benefit Republicans passed during the Bush years and Medicaid – most of which goes to the elderly for care in nursing homes when elderly. The Democrats could propose we deal with each of these programs separately and within their own dedicated taxes which could be raised up or down as necessary. You could even fold in parts of Obamacare if you wanted. The rest of the budget is where deficits are occurring. If people are worried about deficits then there should be no tax cuts for anyone. Including the middle class. The increased revenue will reduce deficits and reduce the need for government borrowing. All those folks now lending to the government will find the government has less need to borrow and the surplus of available funds will cause interest rates to decline further. Possibly into negative territory. They will have to find other ways to invest outside of lending to the government. This is basically all Clinton did in the 90’s. If people really were worried about deficits they would then have to deal with them within the confines of those programs that are actually causing the deficits. The only reason to have everything consolidated is to afford the politicians the opportunity to siphon funds from those programs running a surplus to those programs causing the deficits. Why do the Democrats let the Republicans get away with this nonsense? @GulfCoastPirate: Hey stranger!! ;-) You are right. The clowns that own Outback Steakhouse even attempted to claim that as the reason why their earnings disappointed Wall Street. Turds, all of them!! @GulfCoastPirate: Why do the Democrats let the Republicans get away with this nonsense? Why? Because, unlike Bernie Sanders and a few others, most are looking for lobbying jobs if they get run out of office by the voters. Can’t piss off future paymasters. @Phil Perspective: One of those clowns is Mittens. So no surprise there. Billion-dollar welfare queen. ALWAYS low wages. The idea that Sam Walton’s creature, which has metastasized beyond his wildest dreams, plans to make billions from manipulating health care (or any other) legislation drawn to its desires is, well, entirely predictable. But thank you, Marcy, for anticipating and documenting this example. I may have as many rights in the voting booth, exercisable once in a blue moon, as Citibank or Wellpoint. Both outrank me by several billion in the pay-to-play stakes that rule in Washington, and they and their peers spend that money every day. The Supreme Court, Congress, the White House, K Street, and America’s wealthiest individuals and corporations may delight in that perversity. No one else should. If nothing else, this should help dispel the notion that there is anything open, competitive or free about the American form of big business capitalism.